Happy Wednesday! So glad its almost the end of the end. For myself it doesn't really matter but for the rest of you, I hope the next few days go by fast! 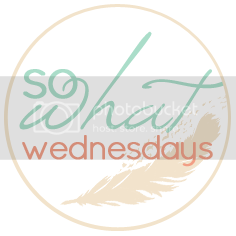 Today I'm excited to link up for the first time with Shannon for the So What Wednesday! My obsession is Sweet Kiwi Frozen Yogurt. My cousin get us hooked last year and now they opened one a few weeks ago like 10 minutes away so we go ALL the time! I got a 92 on my Stats test last week. I'm actually kind of joking. Its a big deal. I've been getting 75-80s so I'm very excited! I'm addicted to watching Teen Mom 2 and 19 kids and counting. My life is quite boring so I get enjoyment from watching others lives. That frozen yogurt sounds incredible! Congratulations on your A in Stats! I'm TERRIBLE at getting my haircut when I'm supposed to. In my defense, my hairdresser is really far from both my home and work (and I won't go to anyone else) so I can only go on Saturday's... and I've been busy on Saturday's for the past, well, forever. Hopefully next weekend I can go! Woo! A 92 in stats? You go girl! Is it bad that I don't even remember the last time I got my hair cut?! I'm trying to wait and go in the beginning of May, but it's looking bad, ha! I got my haircut in the beginning of December, and then just a week or two ago. I am definitely not a prompt hair trim person. AND GREAT JOB ON YOUR STATS NONSENSE, ERM, I MEAN TEST! I say that with all of the "I don't understand math!" enthusiasm of my soul. I'm so glad for you! Also, I'd like to invite you- I am hosting a HUGE collaborative giveaway on my blog next month. It's only $5 to join and you will not only get your face and blog linked up on all the posts with the giveaway form but you will also get ALL of your social media attached in the Rafflecopter form for people to follow for entries! Let me know in an email if you are interested :) I'd love to have you!